Editor's Pick: 9 of the Best Craft Fairs in the United States! 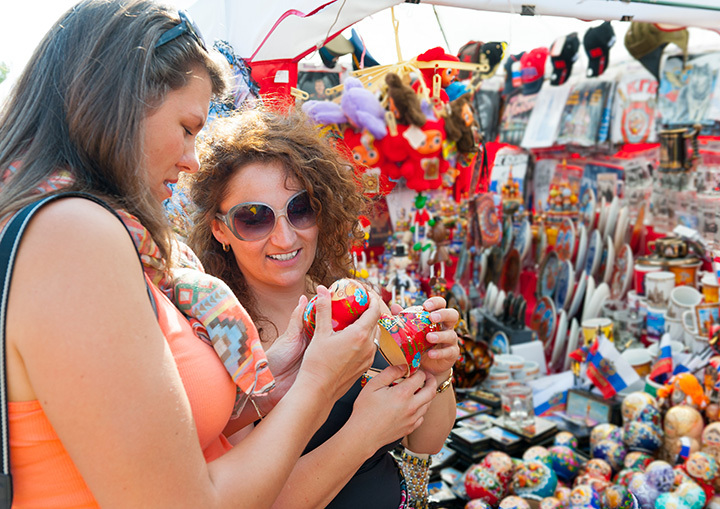 Whether you're a crafter, a maker, or just appreciate the beauty of a well-made piece of art, a visit to the craft fair is always a good time. American love to make art, and we love to get together to show it off, too (and maybe listen to some good tunes and share a few snacks while we're at it). If you're in the mood for a DIY diversion, we've got just the thing! Check out our list "in no particular order" of nine of America's best craft fairs, and then plan to drop on by for art, food, and fun. This Portland festival may not be the biggest craft fair in the country, but it is arguably the only one boasting a Yeti for a mascot. Started in 2008, Picnic brings together Portland area artisans, musicians, and foodies for a day of community, commerce, and creativity twice a year: once in the summer, and again at the holidays (when the Yeti is known to make an appearance for photo ops). What:Picnic promises more than 100 vendors selling "clothing, jewelry, prints, accessories, bags, plush, stationery, photography, housewares, fine art, and more". The festival also features live music and a variety of food vendors. When: Summer and Winter, annually. The 2016 summer festival is August 6th. Why settle for a single crafty weekend when EVERY weekend can be a craft fair? That's the philosophy behind Crafted at the Port of Los Angeles, a year-round crafting and art bonanza based in a restored 1940s warehouse. In addition to perusing the hand-crafted creations of more than 100 creators, visitors can take art classes, get up close and personal with the artists, and sample culinary creations from artisanal food vendors. What: Year-round "artisanal food, handmade jewelry, art, and more." Art and crafting classes are also available, with free admission and parking. When: 52 weekends a year, 11 AM to 6 PM. An outgrowth of the grassroots Maker crafting and invention movement, Maker Faire isn't so much an event as it is a phenomenon. Billed as "The Greatest Show (and Tell) on Earth," Maker Faire brings together technology lovers, crafters, artisans, inventors, artists, and garage-lab geniuses to celebrate the wondrous variety of humanity's creativity in creating new art and tech while addressing some of its oldest problems and exploring the future. Visitors can peruse countless crafts and creations, take classes, and enjoy hand-crafted food and drink. What: This "science fair meets country fair" has something for just about everyone in the do-it-yourself (DIY) crowd. Whether you want to buy a robot dragon for your den or learn how to make hand-crafted wood furniture using ancient methods, you can probably find it at Maker Faire. When it comes to arts and crafts awesomeness, Crafty Wonderland gives craft lovers something of a two-for-one. The Crafty Wonderland retail storefront operates year-round, and also sponsors two craft fairs every year: A Spring Art & Craft Market, and a "Super Colossal" Holiday Sale. Really, though, both events could be called "Colossal," since they each feature the work of more than 200 artisans. What: Dedicated to showcasing the very best Portland has to offer, Crafty Wonderland's store and shows focus on the work produced by local artists, crafters, and artisans. Jewelry, papercraft, furniture, health and beauty products, and home decor are just a few of the categories covered in this massive offering. Show up early for a shot at a goody bag! When: Storefront: year-round. Shows: June and December, annually. The Spring 2016 show is June 4th. Readers of Bust magazine are accustomed to receiving plenty of craft-related content in their mailboxes and inboxes each month. The Bust Craftacular, however, takes crafting off the page and to the public, via shows in three major U.S. cities (and across the pond in London). These crafting events are chockablock with artists and artisans, as well as plenty of free events, classes, music, and food. The Spring shows also feature health and beauty artists to give showgoers a new look for the new season. What: More than 100 "Body, Beauty, Bridal, Vintage, Housewares, Clothing, Accessories, Original Art, Food and Jewelry vendors." Free goody bags for the first 200 visitors! Founded in 2004 as a grassroots showcase for Pittsburgh artists, DIYers, crafters, and inventors, Handmade Arcade is still run by its founders (along with an ever-expanding team of volunteers). What: "Accessories, artwork/illustrations, bath & body, children's clothing, clothing, geekery, housewares, jewelry, music/'zines/multimedia, posters & prints, stationery & paper craft, t-shirts, toys, and more." Classes and "Hands-on Handmade" demonstrations, food, music from local DJs. When: December. The 2016 show is December 3rd, from 11 AM to 7 PM. Much like Portland's Crafty Wonderland, this Fargo, ND shop gives craft-lovers the best of both worlds: two year-round storefronts and a craft show (not to mention gourmet cupcakes at the Unglued Fargo location). The show, held every February, not only features a wild and wacky blend of arts and crafts, but a jam-packed schedule offering drop-in workshops, demonstrations, classes, and more, as well as live music, plenty of food, and a variety of goodies and samples. This "epic festival of handmade goods, music, culture and DIY wonderfulness" is held every September in the village of Yellow Springs, a community well-known for its love of art and creativity-as well as its semi-annual Street Fair (another popular attraction for crafters). Offering just about everything from handknit hats to hand-crafted hot dogs, this craft fair also has a craft beer garden, music from local DJs, and activities for both kids and adults. What: More than 80 vendors offering handmade crafts, clothing, jewelry, food trucks, furniture, accessories, and more. Kids activities, a craft beer garden, food, music from local DJs. When: September. The 2016 event is September 10th from 10 AM to 7 PM. These fairs are the grandpappy of them all (although Renegade prefers to style itself as "The world's premier network of events serving the DIY craft community"). With around a dozen events every year in cities across the United States (and around the world), Renegade is a juggernaut of crafting artistry that connects creatives with consumers via artwork, crafts, classes, and community. What: The whole ball of wax. "One part entrepreneurial incubator, and one part community gathering space, it all culminates in a festive celebration of DIY featuring maker-designed goods, inspired surroundings, interactive features, artisanal food and drink, lively music, and good vibes."